Figure 1 — Map showing locations of the 36 populations in the baseline (dots) and 9 fine scale reporting regions (shaded areas). Note that the dashed line separating the U.S. and Canada divides the Border region. The ADF&G Gene Conservation Laboratory (GCL) helps in the management of Yukon River Chinook salmon by providing estimates of stock composition. These estimates are made in two steps. First, fish from a test fishery are genotyped with molecular markers called single nucleotide polymorphisms (SNPs). 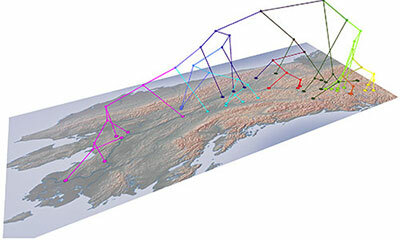 Second, these genotype data are then analyzed with mixed-stock analysis (MSA) algorithms that provide estimates of the proportions of fish from various stocks. An important part of this process is the sampling of spawning populations contributing to the fisheries. The genetic baseline in the Yukon River drainage has recently been increased from 27 populations to 36 populations. With this new baseline, MSA samples consisting of at least 200 fish can be confidently assigned to 9 reporting groups (Figure 1). The Koyukuk River drainage and the Teslin area in Canada have now been split out as separate reporting groups. The Border region has expanded to include the Kandik River, and like past years, fish assigned to this region in MSA will be assigned to Canada; an important consideration when interpreting stock composition estimates of country-of-origin. Figure 2 — Population structure revealed by 41 SNP markers. Genetic distance between populations is inferred by the length of lines connecting the tree nodes. The identification of reporting groups is based on the distribution of genetic variation among spawning populations (Figure 2), but also by the performance of the MSA. A large amount of effort has gone into sampling and resampling spawning populations in the baseline. The sizes of the fishery samples influence the accuracies of MSA estimates for the 9 reporting groups. When fishery samples are 200 or larger, MSA estimates for all 9 reporting groups can be confidently made. When sample sizes are between 101 and 199 fish, estimates are limited to three broad regions. 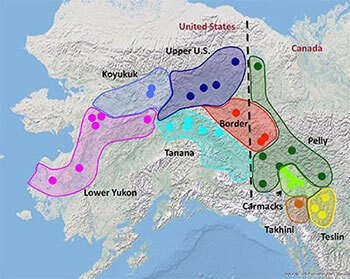 These regions include populations in the lower Yukon, the middle Yukon (Koyukuk, Tanana and upper U.S.) and all Canadian populations. Samples sizes of 100 fish allow only for estimates of country-of-origin. With large samples sizes, MSA estimates are reported hierarchically including fine-scale, regional-scale, and country-of-origin results.